The argument for fake wedding flowers has two sides. Some people like the idea, and some people cringe at the thought of using silk flowers for their wedding. Save Money - You may be able to significantly reduce your flower costs by choosing silk. There are, however, different levels of silk flowers that vary in price. Keep Your flowers Forever - Real flowers are good for a few days or maybe a week. In 20 years silk flowers will look as good as they did on your wedding day. Out of season Flowers - You can choose any type of flower, regardless of the season. You won't have to worry about special ordering out of season flowers. Quality of Flowers - As long as you choose high quality silk, you won't have to worry about what the flowers will look like on your wedding day. Do It Yourself - For the do-it-yourself bride, this is a great option. You can order your flowers online or get them from a local craft store. Stigma - There are some people that look down upon fake flowers. This is something you will have to ignore if you choose silk. No Fresh Flower Smell - One thing that will be absent is the smell of fresh flowers on your wedding day. They May Not Look Real - There are different levels of silk, so shop wisely. Also, some flowers just don't look as good in silk. 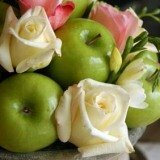 Finding Good Silk Flowers - Depending on where you live you may have difficulty locating high-quality flowers. Shopping online is an option, but do extensive research. 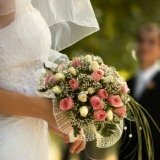 Finding a Florist - If you don't want to do them yourself, you may have trouble locating a florist that will help. Perhaps a wedding planner could help. In the end it comes down to personal choice and budgetary concerns. Always remember that this is your big day, so do what makes you happy!